Preheat oven to 350°F. Line a 12-hole muffin pan with cupcake liners or coat pan with cooking spray. In a medium bowl, sift together flour, baking powder, baking soda and salt; set aside. With an electric mixer on medium speed, cream together butter, sugar and vanilla until light and fluffy. Add eggs and yogurt; beat until well-combined. Reduce mixer to low and alternating in batches, add a little flour mixture and a little milk, until batter is fully blended; beat on high for 30 seconds. Spoon batter into muffin tins about 3/4s full. Bake until tops are slightly golden and a toothpick inserted in center of a muffin comes out clean, about 18 to 23 minutes. Place pan on a wire rack for 2 minutes and then remove cupcakes from pan to cool completely. Meanwhile, to make icing, using a double-boiler or a small heavy pot over a very low flame, melt chocolate completely, stirring constantly, so it doesn’t burn. 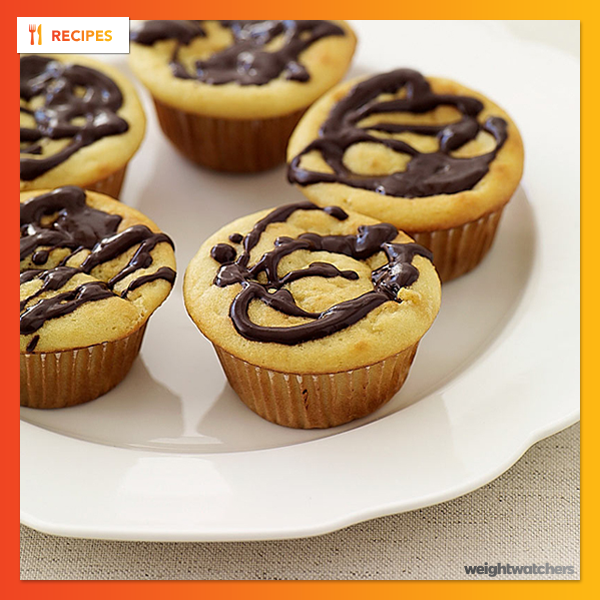 When chocolate is completely melted, whisk in hot water and combine well; drizzle over cupcakes. Yields 1 muffin per serving. You can swap almond extract for the vanilla extract if desired.